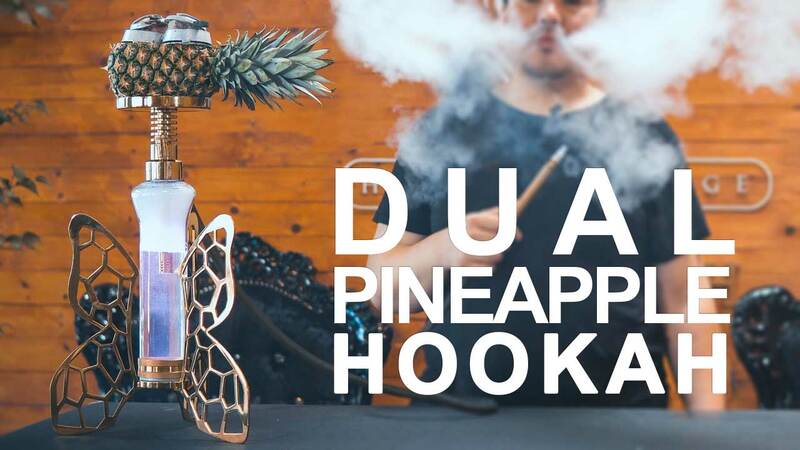 For this particular hookah we use a large pineapple that would fit 2 heat management units. We measure them and carve the pineapple so 2 of the heat management units would fit on the pineapple without touching each other. In the bottom we have to carve 1 hole to connect it to the hookah stem. Make sure to carve 2 air holes in the pineapple and connect them in 1 bottom hole so the air freely moves between 2 slots for tobacco. Once everything is carved out, create 2 bases in two tobacco slots using toothpicks. Now we can put the tobacco inside of the pineapple and put charcoals on top. Wait for 3-4 minutes until the hookah is ready and enjoy!